Drive E-16 from Bergen to Voss and continue to the traffic circle with a gas station on your right, where you make a left onto Hwy. 13. Drive Hwy. 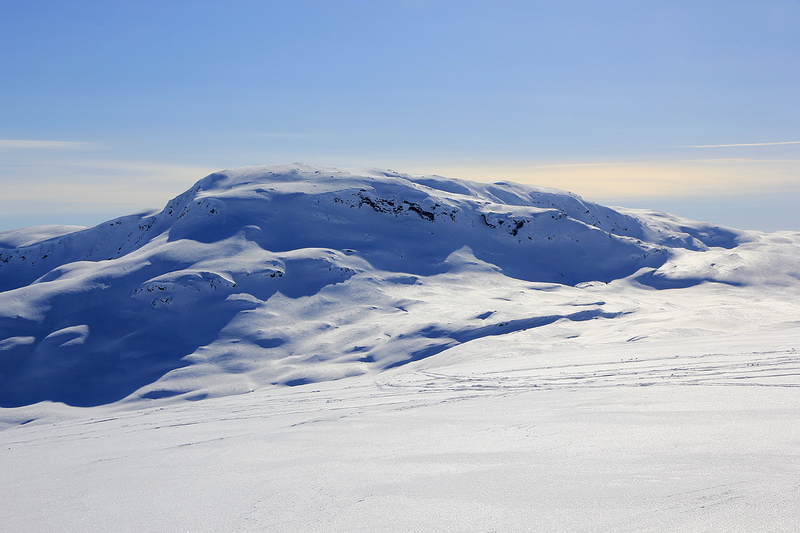 13 towards Vik, you will pass the ski-area called Myrkdalen, then enter a steep grade with 4 switchback turns. Continue uphill about 3 kilometer, you will pass a gate and see the blue sign marking the border between Hordaland and Sogn og Fjordane about 50 meter ahead. There is parking on your left. This is the trailhead, location N60.92456, E006.44615, elevation about 980 meter. Head uphill from the parking, then traverse more right as you climb the slope that steadily extends higher on your right side. On (nice) weekends there may be quite a visible ski track as this is a pretty popular ski trip. 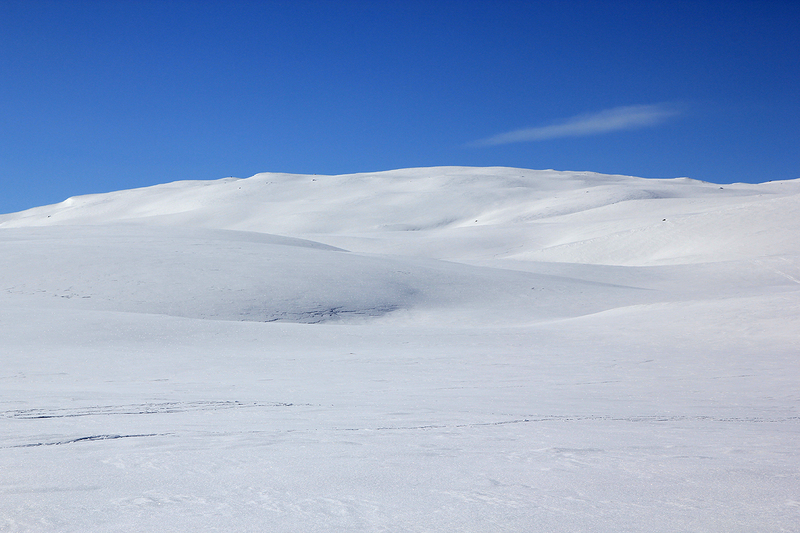 There are some rather shallow "valleys" that need to be crossed, but generally one can just ski easy slopes as they appear in front of you. Thus, there are quite a few false horizons before you arrive at the summit. Near the summit one should ski along the current ridge, then see the natural connecting (very broad) saddle to the final summit ridge. There is a large cairn at the summit. The one-way distance is about 5 kilometer. I had arrived at the Myrkdalen hotel the previous evening after a nice birthday party for Per Ove Oppedal at Fondsbu, Eidsbugarden. The PhD students in the department had invited me to attend their annual ICT Research School and give a talk. On the first day (ie. this day) they organized a 3 hour break to teach basic skiing skills to many of our PhD students from abroad. I took my car and drove up the valley to the trailhead. Starting at 1255, I had a wonderful skitrip to the summit. Not a single person, perfect snow and weather. I broke my own track in easy snow, somehow nicer than following ski tracks from the weekend. I arrived at the summit at 1410, so 1:15 - really excellent conditions. I left the summit about 10 minutes later and enjoyed the very nice slopes back to my car in about 30 minutes. 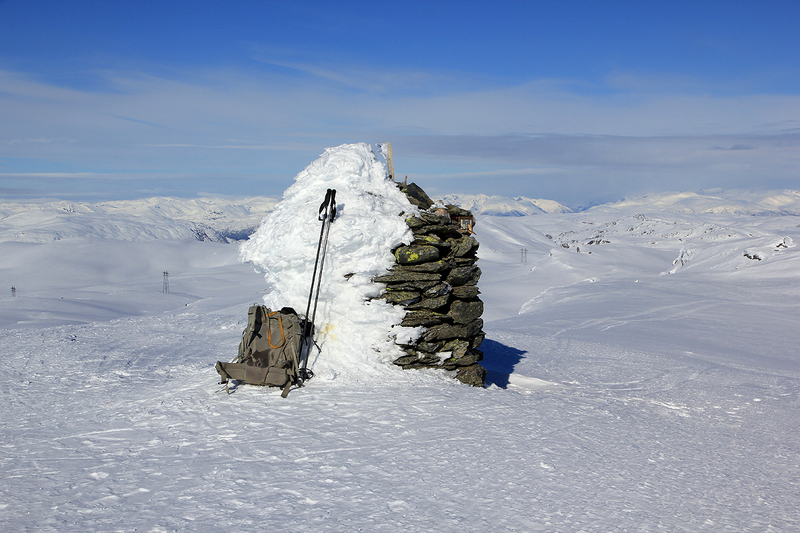 Grøndalsfjellet, the summit is further behind. Finnbufjellet, the Myrkdalen ski slopes are on the other side.